Im Oktober 1830, zwei Monate nach diesem Briefwechsel zwischen seiner Mutter Christiane und Friedrich Wieck, dem berühmten Lehrer, zieht Robert Schumann nach Leipzig um, in zwei möblierte Zimmer, die ihm Wieck in seinem eigenen Haus vermietet, um unter dessen strenger Aufsicht den steinigen Weg einzuschlagen, der aus ihm einen Klaviervirtuosen machen soll. Hier finden Sie in Kürze die Fortsetzung der deutschen Übersetzung (im italienischen Original und in englischer Übersetzung steht der Text bereits komplett zur Verfügung). In reality, exactly this restless “fantasy“ turned out to be an insuperable obstacle between Robert and the achievement of his objective – ever since his childhood his cultural horizons had been too vast and manifold to be adapted to the narrow prospect of disciplined and methodical exercises. And it was his bizarre creativity to now give him the idea of tying two fingers of his right hand in a device that was supposed to strengthen them by immobilization. He hoped it would save him hours of excercise, shortening the approach to technical perfection. But the consequence was a nerve injury in his right hand that made it impossible for him to play the piano at all. Robert would never become a great virtuoso. Friedrich Wieck‘s infallibile method probably had not been designed to be applied to a visionary genius, and the time spent as the his tenant didn‘t show the desired results. But there was someone else growing up in Wieck‘s home, Clara, the severe teacher‘s daughter. Studying she was living every aspect of a secluded and regulated life under her father‘s inflexibile control, his “creature“ and “living proof“ of the efficiency of his method. Nevertheless, due to one of those entanglements of destinies and kaleidoscopic reversals of roles that are transferred from art to real life, also in Hoffmann‘s tale we find the character of Clara (nomen est omen), Nathanael‘s faithful friend and fiancé. With the limpid rationality, with the affection and the uprightness of her nature she tries to redeem him and to disperse the dark clouds building up in his soul. One day this will also be the role of Clara Wieck as Robert‘s wife. Two decades later, in the 1850s, during his last battle against the madness that will uproot him from himself and from this world, she will try to hold back her husband‘s spirit on earth, a spirit inevitably destined for alienation. 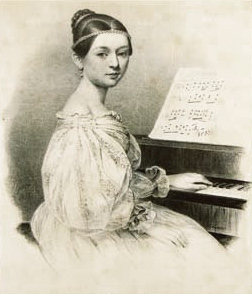 This transmigration from one role to another, the embodiment of two different and opposed characters (a situation that creates an atmosphere already extremely “schumannian“ by itself) will really happen: Clara will first be Hoffmann‘s Olympia and then his Clara (“Clara Wieck, Clara Wieck Doppelgänger“ she signs a letter to Robert in 1830) just as Robert will be both Florestan and Eusebius. But coming back to the first meeting of the two of them, it will be just the tale to build a bridge between the distant and complementary worlds of Robert and Clara, a bridge that will finally unite them up to the point of her becoming sort of his alter ego. It was the long stories he told her, during afternoons spent together at home or walking around the town and the nearby countryside that to provide nourishment essential to the fantasy of a girl growing up without dolls, without books, but whom the father made practice with a Logier apparatus since the age of two, in order to strengthen her tiny hands… In Robert‘s inner universe Clara found the real, lively and consuming world she needed, the emotions and dreams she was thirsting for as an adolescent. 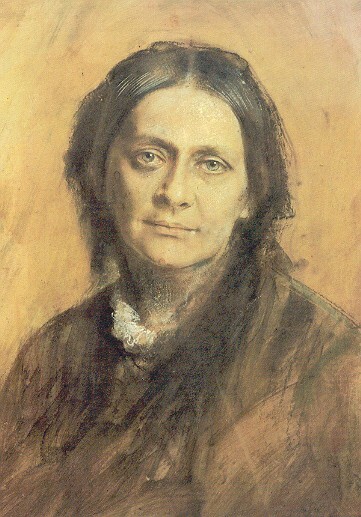 Schumann never stopped telling tales all his life: he told tales to Clara, later to their own daughters and to the world, with words and with music. Sometimes he told his tales in a implicit and hermetic way like in the hundreds of messages, symbols and enigmas encrypted in his piano compositions of the 1830s and 40s. 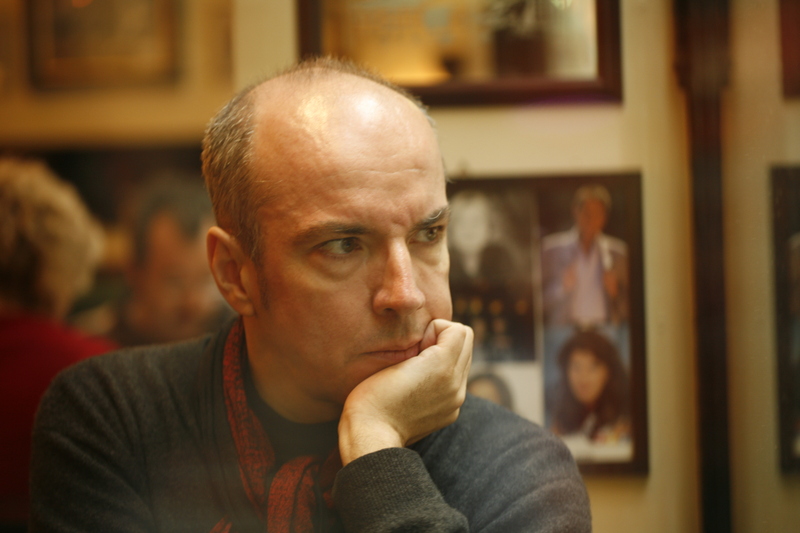 Often he exchanged, confused or identified the roles of narrator and listener with the recurring yet constantly new role game of his characters. Who can tell who is the subject of Von fremden Ländern und Menschen (Of foreign Lands and People) in Kinderszenen? The person who is telling and describing or the one listening and imagining, enchanted? And what about Der Dichter spricht (The Poet speaks)? Isn‘t it once again the reflection of storyteller and the listening child that makes it impossible to distinguish one from the other? The topic of Tales reappears clearly in Schumann‘s late creative period: In Balladen (Melodramas) from 1851, music and text bend forward towards each other to meet at a spot that is always mobile, suspended above a border area: one becoming almost a punctuation of the other (some short parenthesis, accents and musical interventions serve as commas, exclamation marks, making the voice search for special intonations…). The performers are continously challenged to exercise their fantasy, attention and precision in adjusting this spot. Schön Hedwig already anticipates the heraldic, chivalrous, slightly rigid and stereotyped atmosphere of the second piece from Märchenbilder and in particular of the last Märchenerzählung. The style has become almost Biedermeier: as Charles Rosen comments, during the last period of his life Schumann forced himself to normalize his creative language. For example he republished his early works trying to remove bizarre or peculiar details, as if now, on the edge of alienation, he were afraid of – and escaping from – those marvellous effects of illogicality, paradox and madness he had been playing with in his music of earlier times. This lines up with a more classical and unrelenting tendency (now that the fervour of early romanticism has gone out) that had its main pioneer in Brahms, but that was also ideal for composing Hausmusik (music to be played at home) of an attainable level of difficulty, in order to ennoble and raise the standard of amateur music played in a family context. 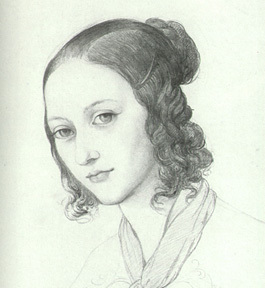 The story of her life is also imprinted in Clara‘s gaze: we can read it if we compare how her almond eyes look at us from the lithographies of 1832, when the father told her to pose “inclining her head slightly and as if she was looking at something far away, with a melancholy and dreamy expression“ and how differently she looks on the last portraits of the 1870s: here we see the haggard, infinite awareness of someone knowing to have been witness and protagonist – to have devoted one‘s own existence to a matter unique in the history of music. This last look must have been not dissimilar to the one Robert cast upon her at Endenich:“I‘ve met him again, in the evening between 6 and 7 o‘clock. He gave me a smile and embraced me with great effort, because he couldn‘t control his limbs […]. I would never exchange this hug for all the money in the world […]. It was a look already clouded, but nevertheless indescribably tender“ (from Clara‘s Diary, 27th-31st July 1856). It was a last glimmer of his spirit, the final mirroring and mutual identifying with each other of the two of them. Something of all this was already implicit in the third piece from Märchenerzählungen (Fairy Tales), with its delicate and slightly pedantic renunciation that solves the rigid and puffed up tension of the other three pieces: in those there is a reflection of that affectionate meticulosity that made Robert note down every single aspect of their married life (listing even the times when he had slept with her) – to the point when, in the coda, all there remains is a sort of exercise: nothing more than an arpeggio alternating tonica and dominant in the piano, it is repeated and spelled out painstakingly, as a child would do, maybe a first symptom of the outline Schumann‘s disease was assuming (on the 8th June 1856, at his visit in Endenich, Brahms would find Robert busily copying the names of towns in alphabetical order from an atlas). Nevertheless Schumann manages to tell us in an absolutely personal and touching way of his progressive course towards alienation. In the usual formula of two cadences that don‘t manage to conclude and leave it to the third we find the promise of an infinite and lonely tenderness, together with emptiness and a serenity by now useless, suspended above the vertigo of void as Harry Halbreich writes concerning the last piece of Gesänge der Frühe, Schumann‘s last completed piano composition that subtly corresponds to Märchenerzählungen and was written only one month later. The Quintet op. 44 is dedicated to Clara. It is the first great composition written for this combination of instruments and was composed in September 1842, the year Schumann devoted almost entirely to chamber music. The piece was first performed in private with Mendelssohn at the piano on the 6th of December of the same year, whilst Clara took part in the first public performance on the occasion of a Matinée at the Gewandhaus in Leipzig on the 8th January 1843. One month later in Dresden it was this piece to seal the reconciliation with her father (their relation had been interrupted after the marriage with Robert in 1840). Wieck organized a soiree, inviting some thirty persons to a performance of the new composition of his son-in-law. Wagner was there, and he was enthusiastic: “I have thoroughly enjoyed your Quintet, my dear Schumann; I implored your wife to play it twice […]. I can see the course you want to adopt and I can assure you that it is just like mine. This is our only chance of salvation: beauty“. (Courteous assertions, slightly generic and surprising, if we consider how different the artistic destiny of the two musicians would turn out…). According to his daughter‘s diary Friedrich Wieck was “on fire“ about the Quintet – probably the utmost expression of approval for the sullen educator. Schumann wanted Berlioz to listen to the piece, but his comment was “cold, indifferent and dismissive“. Even Liszt for once lacked generosity, arriving late for a soiree in his honour on the 9th June 1848: He defined the composition “leipzigerisch“, not a favourable term and maybe referring to the specular symmetry of some of the musical phrases, that he evidently ascribed to the academic and a little mannered taste of the high society of Leipzig, with Mendelssohn as the ideal model. It was a disdainful comment of Liszt‘s about Mendelssohn that caused a bitter and unpleasant quarrel between him and Schumann, for whom the memory of his friend who had died only the year before was sacred. In any case the vivacity of the reactions is proof of the immediacy and the communicative strength of the work, whilst the numorous times it was presented to the public prove the trust Robert and Clara put in its fate. This is radiant music, determined and wistful, albeit created at a time when the idealized and fantastic love of the two of them had clouded over with jealousy, frustration and pettiness in family life. The Quintet is sunny and extrovert, yet not lacking surprising “descents into hell“ like at the beginning of the development of the 1st movement (maybe a reminiscence of the Aria Es ist vollbracht from the St. John Passion by Bach). But under the surface a web of references and corrispondences are hidden, some of which are immediately obvious, others maybe still mysterious, for example the prophetical and veiled insistence on the notes “e – d“ in the first trio of the 2nd movement that corrisponds to an equally long series of “e flat – d“ in the last movement, con anima and mysteriously tied to the first. Reuniting the thematic ideas of the preceding movements, the finale combines them and they line up in a glorious March of the Davidsbündler against the Philistines, a festive gathering of all the characters of Schumann‘s, on the way to a triumphant and glorious conclusion of this memorable, brilliant Tale.